Small 'crossover' SUV to be offered as a hatchback and cabrio. Looked like a spoiler for the Range Rover Evoque convertible. The T-Cross Breeze is a concept convertible SUV that’s definitely got nothing to do with the new Range Rover Evoque Convertible. Nothing at all, your honour. 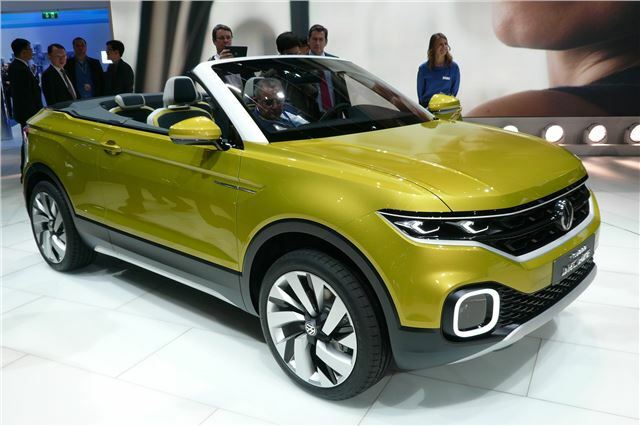 The soft top, four-seat convertible “offers a first look at a newly developed SUV model series,” says Volkswagen. And while the company is quite vague about what that might be, the clue is in the length: at 4133mm this is just 2mm shorter than a Nissan Juke. That makes this the basis of, yes, another compact crossover. The fact that it squeezes four seats and a convertible hood into that sort of length is basically Volkswagen showing off about the T-Cross’s packaging capabilities – the four-door production model should be pretty spacious. This will underpin a whole six-strong family of SUV-type cars, beginning at this and ending with a massive seven-seat new Touareg. It’s likely that there will be a convertible version of one of these in the showrooms at some stage, though a final decision probably rests on the success or otherwise of the Evoque, which we’ll start seeing on UK roads shortly. The cockpit makes heavy use of LCD screens to be as minimal as possible, and while that’s likely to be pared back for the “affordable” production model, it does suggest that this will be more 'Up' in feel than, say, Golf. The concept is powered by a 1.0-litre TSI turbo petrol engine with 81PS, which is likely to be in the majority of the production versions sold, although in keeping with the compact crossover market it’s likely that the 1.4-litre TDI diesel found in the Polo will feature too. That’ll drag CO2 emissions down to the 90g/km mark. And in an effort to emulate the effortless cool of the Fiat 500L, it comes with a Beats Audio system, Volkswagen having teamed up with billionaire General Practitioner and hip hop enthusiast Dr. Dre.